Last week I was in Palm Springs at what was essentially Club TED. 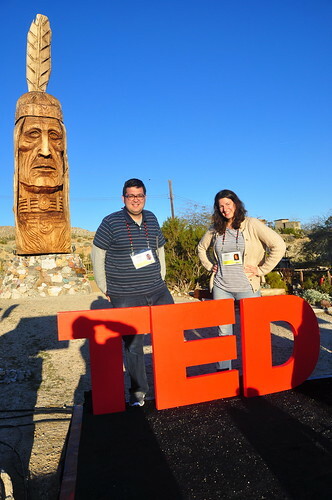 Along with about 500 other people at TEDActive, I watched a simulcast of TED 2011 from The Riviera Resort and Spa. It was totally awesome and extravagant to be mentally stimulated in such a deluxe way; There were screens all over the resort. The designated main room was full of posh Steelcase seating clusters, each facing their own duo of Sony flat screens. Additionally, there were other rooms full of snacks, coffee bars, refrigerators full of beverage choices, and power strips up the wazoo with a variety of seating arrangements and screens everywhere. The most lavish area were the cabanas around the pool, also with dual screens and Lawrence-of-Arabia-inspired interior designs. It was a monumental few days, and I’m still mourning the fact that I had to leave early to get back to New York in time for TEDxNYED which I co-curated with Basil Kolani (@bkolani). However, we pulled off a pretty spectacular event that exceeded even my high expectations, thanks to the good people at the New York Academy of Sciences and our amazing team of organizers: Dan Agins (@agins213), Erin Mumford (@erinmum), Jeff Weitz (@scienceteacher1), Kiersten Jennings Chou (@choutofu), Sean Freese (@seanmfreese), and Tammy Mckenna (@tmck76). On top of everything else, it was a thrill that Morley, a New York based singer/songwriter/activist, joined us. Below is a video of her song, “Women of Hope,” which includes the line, “If you’re feeling helpless, help someone.” It is my new mantra.